Every once in a while I have to bring out the plastic instruments and play one of these music games. I want to spread them out (if only to keep my notes and write up clear) but there’s so much work in putting some of these up that it feels like a waste – which is why I go for having the guitar out even now. That was, after all, all that Guitar Hero had, but Rock Band came out to make this even more of a party game, allowing up to four instruments at once – guitar, bass, drums and your voice. We’ve seen this formula before in Beatles Rock Band, but here’s the first game that did it like this. With a formula that’s repeated this often, a lot of the commentary for one game applies to the other. It’s ncie to play, I’m getting better at the guitar controls and there’s still a fairly compelling game loop. While that stays the same, the surroundings do change. In this game, your band is playing in the background, rather than the Beatles more psychedelic backgrounds, which works better for the multiple instrument gameplay. It’s quite nice and ties in to the customization the game offers – both the looks of your band members and the clothes they wear, which you can unlock and purchase. It’s not essential to gameply, but creates a nice touch. The songs themselves, then, are the important distinguishing factor. 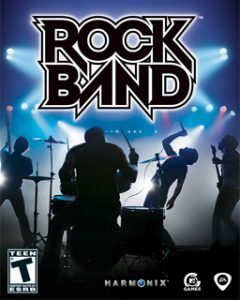 Rock Band focuses on rock songs, as the name implies, and they offer a wide variety for all of the instruments. It’s a shame, once again, that not all songs are unlocked immediately – I understand having setlists for the single player campaign, but it felt like a hindrance for casual play. Rock Band kickstarted a popular genre into the stratosphere for a few years, as the team based play made the rhythm games a real social experience. I never quite felt a part of it, and it’s not something you really feel when you’re home along, but it’s hard to ignore that aspect to it that I can’t review as well now. Even without that, though, jamming in these games stays a lot of fun.